I have been researching issues related to sustainable consumption for the past decade. I view the contemporary consumer society in the US and other wealthy countries of the global north as a construct; a complex system comprising technology, culture, infrastructure, social practices and norms, institutions, political ideologies, and market forces. As such, consumer society is very stable and resilient. My work centres on advancing the understanding of how consumer society has evolved and functions, and on identifying leverage points for fostering a transition beyond consumption-based economy and culture. My interest in this area has evolved from my previous research on corporations, environmental policy and socio-technical transitions, which let me to two key conclusions: First, that environmental policy and corporate good will, while producing radical reductions since the 1970s in the levels of air, water and soil pollution, do not address the root cause of the unsustainable pressures on the earth’s life supporting systems: the ever-increasing demand for materials and energy. Second, that by itself, technologic change, in the form of efficiency gains, new materials and processes, and renewable energy sources, will not produce the necessary reductions (in the US, these being estimated at between 70 and 80%) in the emissions of climate-altering gasses; and that the material- and energy-intensive consumption also must decrease. These interests led to an extremely fruitful collaborative relationship with Maurie Cohen and Philip Vergragt that continues to the present day. The three of us (along with John Stutz) are co-founders of the Sustainable Consumption Research and Action Initiative (SCORAI), an international network of researchers and policy practitioners working at the interface of material consumption, human well-being, and technological and cultural change. 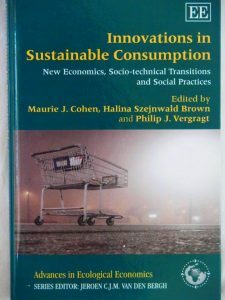 We co-edited in 2013 a book entitled Innovations in Sustainable Consumption: New Economics, Socio-technical Transitions, and Social Practices and we also serve as co-editors of a newly launched book series on sustainable consumption published by Routledge. In 2014-15 we hosted a colloquium series on Social Change and Transition Beyond Consumer Society. At monthly seminars held at Tellus Institute in Boston we asked leading scholars in several disciplines to explore how the theories of social change which their espouse can help us envision a transition beyond the currently consumption-driven society. The colloquium culminated in a two-day workshop in October 2015, and the papers presented at the workshop gave rise to a 2017 book, published by Routledge and entitled Social Change and the Coming of Post-Consumer Society: Theoretical Advances and Policy Implications, co-edited by Maurie Cohen, Halina Szejnwald Brown and Philip Vergragt. 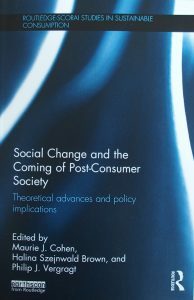 Halina Szejnwald Brown, Philip Vergragt and Maurie Cohen 2017, “Introduction”, In: Cohen, Maurie, Halina Szejnwald Brown and Philip Vergragt, Social Change and the Coming of Post-Consumer Society: Theoretical Advances and Policy Implications, pages 3-22. New York: Routledge. Vergragt, P., Brown, H.S., Timmer, V., Timmer, D., et al. 2016. 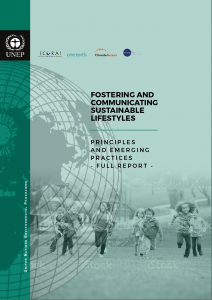 Fostering and Communicating Sustainable Lifestyles: Principles and Emerging Practices. United Nations Environment Programme – Sustainable Lifestyles, Cities and Industry Branch (UN Environment). This report offers a four step strategy road map for success with eight operating principles to guide the design, adaptation, and evaluation of sustainable lifestyles campaigns and initiatives. The 16 cases explore how sustainable lifestyle campaigns intersect with key aspects of meeting core domain needs around food, shelter, mobility, leisure time, and human connections. The report uses the principles to interpret and evaluate these cases. Brown, H.S. and Vergragt, P.J. 2016. From Consumerism to Wellbeing: Toward a Cultural Transition. Journal of Cleaner Production. Brown, H.S. 2014. Editorial: The next generation of research on sustainable consumption. Sustainability: Science, Practice, & Policy 10(1):1–3. Brown, H.S. Philip J. Vergragt, Maurie Cohen 2013. “Societal Innovation in a Constrained World: Theoretical and Empirical Perspectives.” In: Maurie Cohen, Philip J. Vergragt, Halina S. Brown (eds.) Innovations in Sustainable Consumption: Socio-Technical Transitions, Social Practices, and the New Economics. Edward Elgar. Brown, H.S. Philip J. Vergragt, Maurie Cohen 2013. “Societal Innovation in a Constrained World: Theoretical and Empirical Perspectives.” In: Maurie Cohen, Philip J. Vergragt, Halina S. Brown (eds.) Meeting the Crises of a Constrained World: Socio-Technical Transitions, Social Practices, and the New Economics Edward Elgar. Brown, H.S. 2012 (Feature article). Sustainability Science Needs to Include Sustainable Consumption. Environment: Science and Policy for Sustainable Development 54: 20-24. Cohen, M.J., Brown, H.S. and P.J. Vergragt 2011. Individual Consumption and Systemic Societal Transformation: Introduction to the Special Issue 2011. Sustainability: Science, Practice and Policy. 6(2): 6-12. Book Review. Brown, H.S. 2010. “Energy Efficiency and Sustainable Consumption: the Rebound Effect”, by Horace Herring and Steve Sorrell. Sustainability: Science, Practice, & Policy 6(2): 41-42.